The term 'fight-or-flight' represents the choices that our ancient ancestors had when faced with danger in their environment. They could either fight or flee. In either case, the physiological and psychological response to stress prepares the body to react to the danger. In response to acute stress, the body's sympathetic nervous system is activated due to the sudden release of hormones. The sympathetic nervous systems stimulate the adrenal glands triggering the release of catecholamines, which include adrenaline and noradrenaline. This results in an increase in heart rate, blood pressure, and breathing rate. After the threat is gone, it takes between 20 to 60 minutes for the body to return to its pre-arousal levels. The fight-or-flight response can happen in the face of an imminent physical danger (such as encountering a growling dog during your morning jog) or as a result of a more psychological threat (such as preparing to give a big presentation at school or work). Dilated Pupils: The body also prepares itself to be more aware and observant of the surroundings during times of danger. 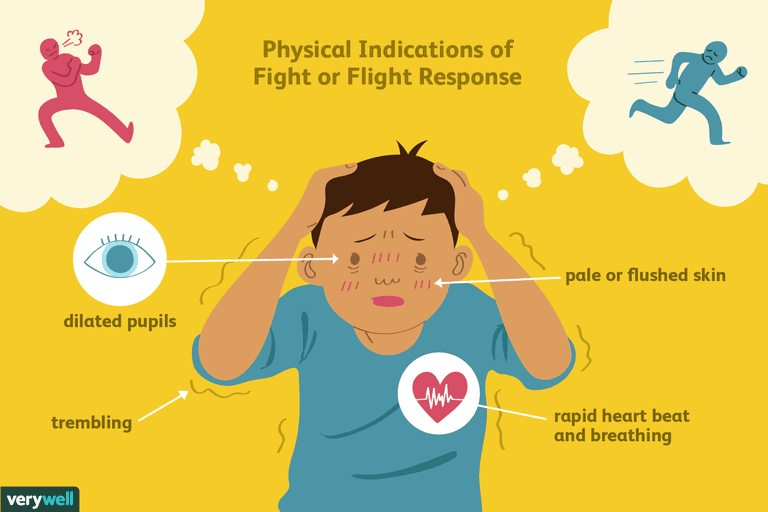 Another common symptom of the fight-or-flight response is the dilation of the pupils, which allows more light into the eyes and results in a better vision of the surroundings. By priming your body for action, you are better prepared to perform under pressure. The stress created by the situation can actually be helpful, making it more likely that you will cope effectively with the threat. This type of stress can help you perform better in situations where you are under pressure to do well, such as at work or school. In cases where the threat is life-threatening, the fight-or-flight response can actually play a critical role in your survival. By gearing you up to fight or flee, the fight-or-flight response makes it more likely that you will survive the danger. While the fight-or-flight response happens automatically, that does not mean that it is always accurate. Sometimes we respond in this way even when there is no real threat. Phobias are good examples of how the fight-or-flight response might be triggered in the face of a perceived threat. A person who is terrified of heights might begin to experience the acute stress response when he has to go the top floor of a skyscraper to attend a meeting. His body might go on high alert as his heartbeat and respiration rate increase. When this response becomes severe, it may even lead to a panic attack.